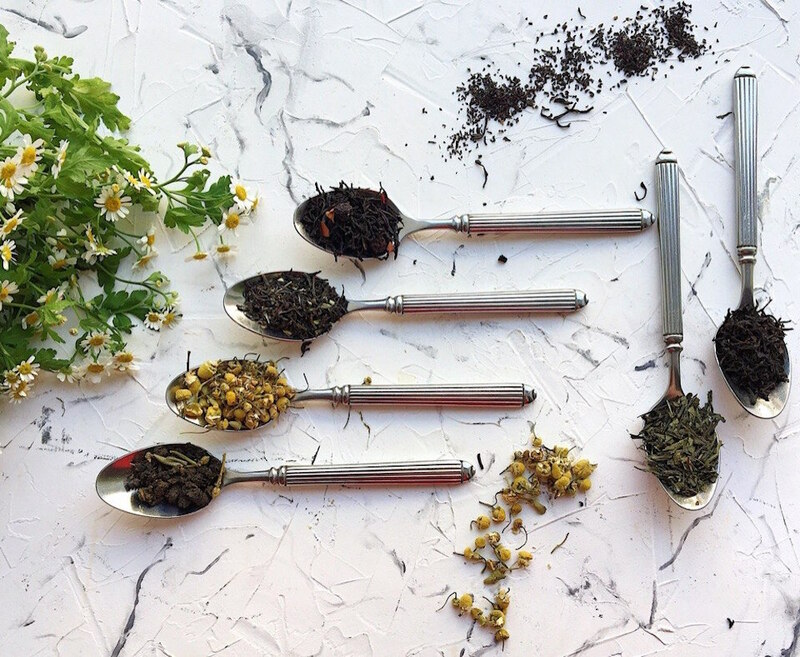 If you’re feeling peckish after exploring the city or taking in a game, then you’re in luck: in Nizhny you’re never far from a rewarding culinary experience. From winning burgers to Italian specials, here are the places you don’t want to miss. 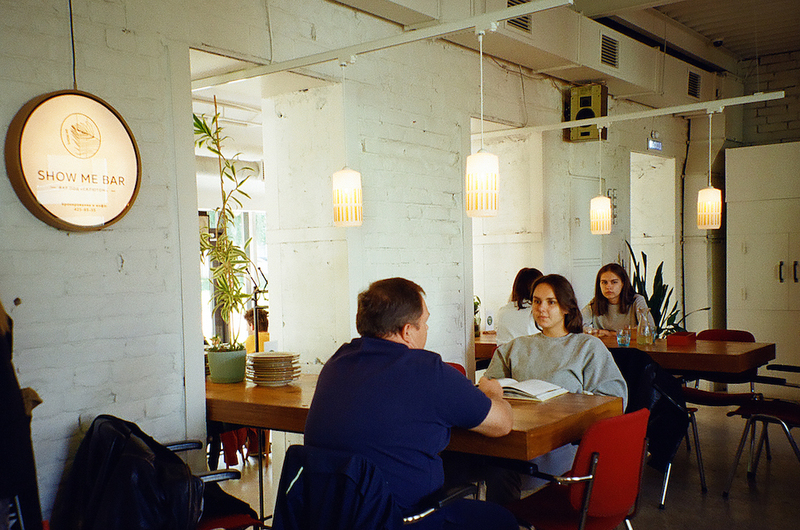 Seledka & Coffee is the go-to bar and the HQ for Seledka, a monthly journal of cultural life. A retractable door folds into the ceiling in summer, and in winter the bar organises regular events, including lotteries and comedy auctions where vintage items are sold for pennies. In the corner of the bar you’ll find Alla Borisovna in plastic form, while outside you’ll see people dancing in the street to Justin Timberlake or Natalya Vetlitskaya and sampling the crazy cocktail menu. In reality this is a small dive bar with a maximum capacity of 70, but thanks to its popularity you’ll see a swarm of 200–300 people at the lower end of Rozhdestvenskaya Street. You can bump into half the city here and happily hang out until morning. Even though the bar officially closes at 2am, guests don’t begin to leave until 4am at the earliest — the bartenders are used to it now and don’t seem to mind. The main burger joint in town, with an eternal queue snaking out of the front door. It’s worth standing in line for the classic black bun burger, which is also available as a lentil patty for vegetarians. For professional dieters there’s a no-bun version, or you can try the prawn burger if you’re feeling adventurous. Salut will also sate your cultural hunger: the Kulttovary record store works to the same schedule as the bar and has a selection of rare vinyl, video concerts are screened once a week, and in summer there is an open-air film programme and ping pong championship. An added bonus are the jugs of complimentary mint water standing on every table — a real rarity in Nizhny. “Falafel, hummus and all that” — this is the slogan for Nizhny Novgorod’s first falafel restaurant, where you can and should try all of the above. 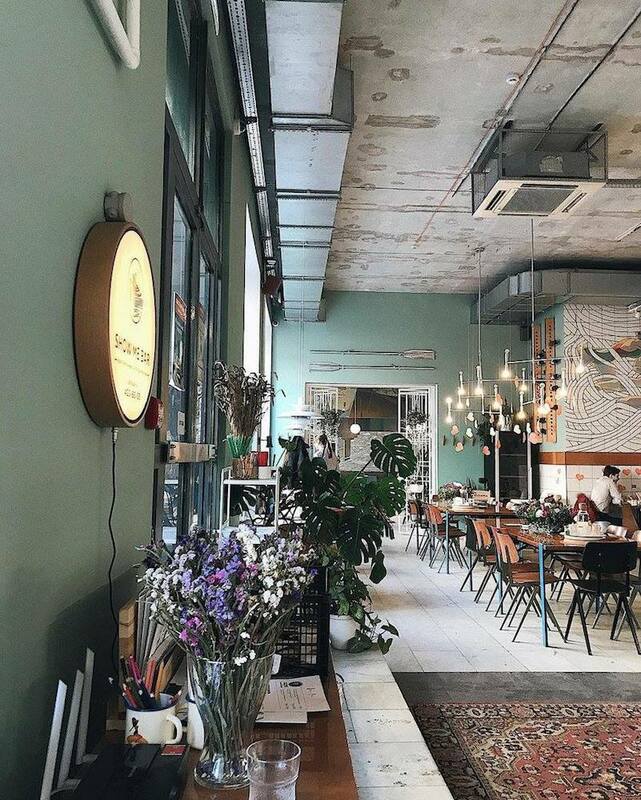 This tiny independent cafe grew out of a project organised for the Restaurant Day food carnival and was so popular that it opened full time, serving some of the most delicious food in the city. For several years now locals have been introducing tourists and travelling bands to Noot, making sure not to share this semi-open secret too widely. Be warned: there are only a handful of tables, and the mini veranda is only open during the summer. A little hole in the wall big enough for a couple of tables, with paintings by contemporary street artists on the walls and skateboard wheels in the bathroom where the toilet roll holder should be. The bartender is a certified chef who will serve up first class meatballs for hungry guests, making this an ideal spot for lunch. Order the set menu with meatballs, coleslaw salad and baked potato, wash it down with a can of Dr Pepper and look over the city from the vantage point of Lykovaya Damba Street. 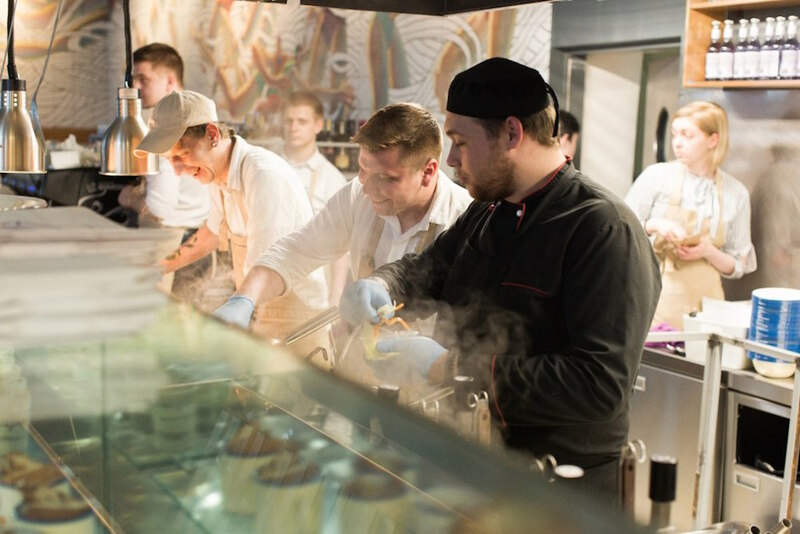 The city’s first pasta bar, where the kitchen staff painstakingly prepare ravioli and arancini by hand. There’s also freshly made risotto, an impressive range of salads and an on-site bakery. Everything is served in enamelled dishes (which locals like to compare to washing up bowls), decorated with the restaurant mascot, the oarsman Gaspar who invites you to “paddle over for a bowl of pasta”. 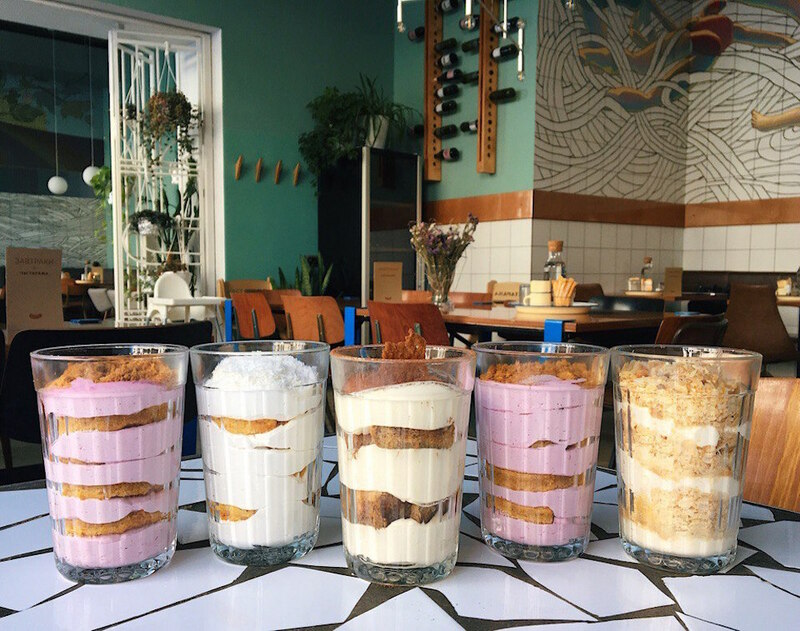 Try the healthy breakfasts designed by a nutritionist, a very recent addition to the menu, or the desserts which can be ordered to take away in dessert glasses. There are regular chamber concerts during the evening, wine tastings soundtracked by vinyl records and weekend workshops for children. Stock up on the essentials at the restaurant shop: spaghetti and pipe rigate pasta, pesto and Pomodoro sauces, mozzarella and even chocolate popcorn. The main draw, however, is the wonderful atmosphere, with huge windows, greenery, a fresh interior and murals worthy of Soviet master Alexander Deyneka on every wall. 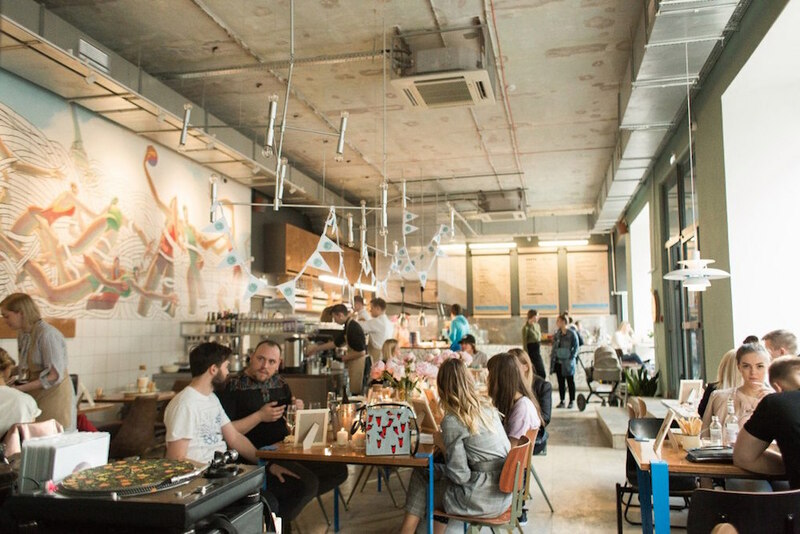 Nizhny meets Naples at authentic pizza joint Yula. 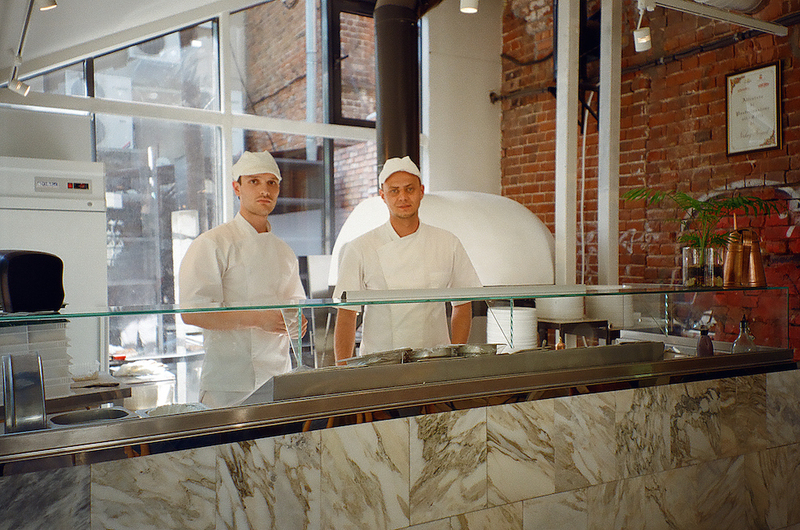 As with all good pizza places, Yula is proud of its oven: wood-fired and on show for all to see. The restaurant’s concise but expertly executed menu features a range of dough-based delights, tantalising desserts and innovative spins on classic Italian appetisers. For something a little unusual, try the signature sweet raspberry and mascarpone pizza, washed down with a bottle from the restaurant’s excellent wine list. The perfect place to restore your strength after a World Cup match or a visit to the nearby Photography Museum, Yula delivers on both food and atmosphere — whitewash brick and stainless steel come together with wooden and marble tables to create an air of industrial chic, with subtle greenery and mellow lighting from minimalist hanging lamps adding a welcoming touch. If you’re lucky, you might even get a little entertainment during dinner, as Yula has also been known to host local theatre acts. In the politest possible way, all we can say is this: va fa Napoli! And by Napoli, we mean Nizhny. Easy to miss but worth the search, intimate cocktail bar Show Me is undoubtedly one of Nizhny Novgorod’s hidden treasures. Situated under stylish burger joint Salut (see above), Show Me prides itself on its exclusive list of trademark house cocktails, which can be paired with an array of delicious bar snacks. These serve as the perfect fuel for dancing the night away, aided also by Show Me’s energetic playlist, positively joyful atmosphere and twinkling disco ball. Please don’t be alarmed by the chemistry equipment behind the bar, though: this is only testament to how seriously these people take cocktails. The bar regularly hosts special theme nights and DJ sets, which sometimes see Show Me venture out onto the waters of the Volga River for epic boat parties (rubber rings encouraged).